Understanding the transportation industry can be a diffult task. Understanding the drivers in the industry is a little easier. We know that drivers want to be shown respect, treated well, and fairly compensated for their work. For us, it is important that all three of those key principles are met on a daily basis with all of our drivers. But that wasn't enough for us and, because we wanted to take it a step further, we found a way to offer additional compensation to our loyal drivers for no extra work. Project Spartacus is the answer; providing drivers with additional revenue, every single month, for doing nothing more than referring other dependable drivers to us. That's it! Nothing more, nothing less. It really is that simple. We want our drivers to reap the benefits of their work, and the work of the drivers they refer us. We know that this may sound too good to be true, but believe us, it's true. The program grows with you as you refer new drivers. Oh yeah, and so does your pay. There's no limit to how many referrals you can have, so the more drivers you bring the more pay you get. Go crazy; we want you to. There is no charge to be a member of Project Spartacus. Seriously, we don't want a dime from you. In fact, we want to give you money, and a lot of it. The program is and always will be free to our valued members. Once setup, you can handle all of your referrals from anywhere. Simply login to the web site to keep up on your referrals and payments. And forget about running to the bank each month with our automatic deposits. As a member you will be given suggestions on how to approach other drivers and print friendly cards to hand out with your name and referral number on it. We want to make it as easy as possible for you to succeed. The program is easy to join and makes it even easier to put extra money in your pocket, every single month. Once you you join Expeditus as a driver, or fleet owner, you are ready to begin. Simply refer new drivers or fleet owners to us and we'll take care of the rest. All you have to do is keep driving for us and make money on each of your loads. While you're out there driving and talking to other drivers, recommend to them to join you at Expeditus Transport. When they do join, you will be paid a percentage of every load they run, every month. You will also be paid a percentage for each of the loads their referrals run, two levels deep, every month. Yes, it really is that simple. the more your rewards will grow. make all of us succeed. By now, after reading all of this, you have to wonder what it all looks like. If you look below, you will see an example of how it would look for our example driver, John Doe. John has referred three drivers, and is making money off each of them. But the buck doesn't stop there. The drivers that John referred also referred some drivers of their own, so John is getting paid for their work, too. But we don't stop the buck there either; we go a full three levels deep for our drivers. So, as you'll see below, the second level drivers under John referred drivers on their own, as well. And yeah, you guessed it, John is also getting paid for their work. The more drivers or fleet owners that you refer to us, the more that you make in extra money, every single month. Go crazy, we want you to. 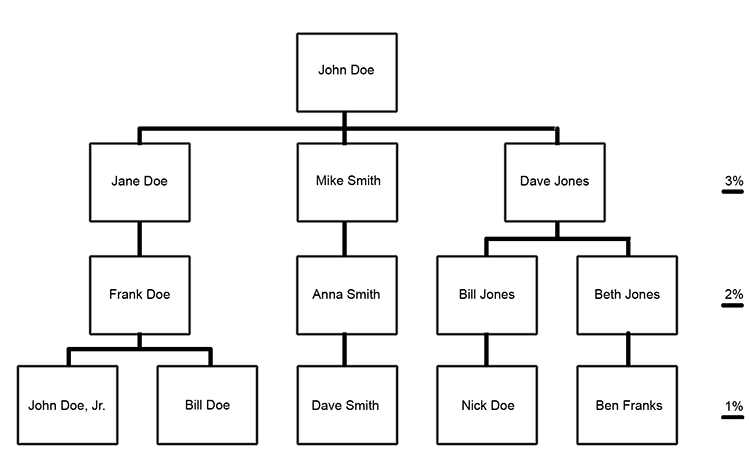 In the example above, John Doe directly referred Jane Doe, Mike Smith and Dave Jones. For each of these referrals, John Doe will get 3% of the gross margin for each of the loads they run for Expeditus, every month. Below these three drivers are their direct referrals, which also benefits John Doe, to the tune of 2% of the gross margin for each of the loads they run for Expeditus, every month. The final level nets John Doe 1% of the gross margin for each load they run for Expeditus, every month. 419-464-7678, option 3, and talk to one of our friendly and knowledgable recruiters. Then, once you start driving for us, you are automatically enrolled in the program. Project Spartacus is a reward program for current and active drivers and fleet owners for Expeditus Transport, LLC. The only requirement for membership is remaining a current and active driver or fleet owner with Expeditus Transport, LLC. There are no charges for membership to Project Spartacus and members are able to leave the program at any time, for any reason.